We've received our new TI-84 Plus Orion talking calculator. It's coming with OS 2.55/ORk, and one of the first things we tried was to install it on other TI-84 Plus. It works perfectly, even on TI-84 Plus Silver Edition, revealing us a correctly displayed new model name, "Orion TI-84 Plus Silver Edition" instead of "Orion TI-84 Plus", an hypothetic future upgrade. But of course without the talking module the OS brings nothing more than 2.55MP, and so that's why we're going to test it on a real TI-84 Plus Orion for you. The TI-84 Plus Orion is actually a standard TI-84 Plus, installed with a modified OS 2.55 MP: In addition to standard functions, it communicates with the module that is physically attached (screwed) to the top of the calculator. The Orion TI-84 Plus calculator consists of a TI-84 Plus on top of which resides the actual Orion module. A dedicated, longer than usual slidecase (with APH / Orbit Research logos) protects both the calculator and its module, quite useful against unwanted keypresses when moving etc. Dimensions : 9.3"x3.5"x1", or 23.62x8.9x2.54 cm. And the reading speed, or rather we should say the ability to quickly speak the keys pressed is impressive, there is no delay (it would have been annoying...). When the calculator is in the process of graphing something like a function, the user knows it thanks to the audio feedback based on the ends of the curve (or at least, it's a easily reconizable noise that happens to fit what we was pltting at that time), and when the tracing is completed, the module describes the graph with a sound whose pitch fluctuates according to the variations of the curve (and a particular sound is produced when the x-axis is crossed). It's very well done ! You can see/hear it in the video below. We almost forgot : the module does also make the whole calculator vibrate, under certain conditions. The module itself has several keys (sound level, preferences , repeat, "Manual" screen reading, etc. ), which make it even more useful. The micro-USB port on the voice module, not mentioned in the documentation is still a mystery. The computer doesn't detect the module when this port is used. However, the website states it's in order to connect other devices, but with no further details (or maybe it's to connect the Braille printer that's talked about ? ). Anyway, no micro-USB adapter or cable is included. And as mentioned above, the 3.5mm jack port is used to connect stereo headphones or speakers. 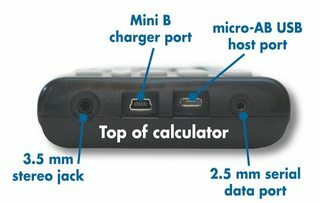 We now propose you to test the compatibility of the TI-84 Plus Orion equipped with its module with some devices or accessories. As implied above, unless you remove the voice module (operation not originally planned as the module is screwed), you can exclude a priori all devices requiring the USB. But we still have some choice . As you can see, this is a special cover/slidecase designed for the TI-84 Plus case types (which therefore also includes the TI-89 Titanium and TI-83 USB Black Plus.fr 2013), putting them in an inclined position, which is very comfortable. Normally two inclinations are possible thanks to a flap which is housed in one of two parallel slots in the back of the calc. Here, the voice module completely blocks the access to the top slot (because it's used to receive the screws attaching the module), but not the bottom slot, which allows to use the TI-kickstand, but only in its maximum angle position. - A small downside that we noticed during my few experiments: it happens, probably very rarely in standard use, though : the module gets "out of sync" and thus the connection with the calculator is lost. It does not crash the calculator nor module, but it will no longer work with the calculator as expected. We simply have to reset it, then (keystroke calculator + restart) to make them function again we think some ASM programs can cause this more easily / often than during standard use. But after all, these programs are not "made ​​for" Orion and the frequency of use of such programs for a typical Orion user is probably zero. - The calculator has a modified 2.55MP operating system (the changes adding the code dealing with the voice module), dubbed 2.55/ORk as already mentionned in a previous news. We also discover that it's including the old Boot Code 1.02. But nothing unusual a priori , since it's obviously an old hardware revision, P, while 1.03 Boot Code was introduced with hardware revision Q. Regarding the previous post... maybe you thought if you're a programmer especially, about the not-so-normal possible uses of the Orion module, for example user-controlled sound output ? Of course, for now, one can think about making it read numbers and words, which is not very difficult and it was shown in the video on the news linked above. But .... already on the traditional TI-83+ and 84+, some programmers have released solutions from relatively simple to a bit more complex but realistic in order to get music from the calculator via the 2.5mm Jack I/O port. - To do that, we can draw a graph in Plot mode with a list of points In Trace mode with a plot drawn, moving with the left / right arrow jumps from point to another and thus switches from a height to another directly ! - It is not with this method that we can have rhythm (on the video, you see that I'm doing it manually). Perhaps with the program Xeda made (IIRC), it can perform a sequence of keystrokes to automate the process ? Or maybe with another way I have not yet found via basic programs to display a point to be read ... (granted, I have not yet tried much). See you soon for some more … peculiar experiments ? It's certainly a very neat tech demo! I'm still waiting for mine, and I plan to write a solid review when it arrives. I intend to include yours with links once I'm able to do my own review (but remember that unlike ticalc.org and Omnimaga, we aren't a community news aggregator. ). Unless I misunderstood you, you told us yourself on IRC to spot you anything we thought as newsworthy. Are you getting your Orion from TI ? Absolutely, but that doesn't mean we're under any obligation to front-page it. In fact, I'd argue that more of our members read the new topics than read the front page for news anyway. That's the plan. I believe they are currently encountering manufacturing hiccups. Absolutely, but that doesn't mean we're under any obligation to front-page it. For some reasons, I think that you've been totally misjudging me - a problem which can only be solved if you take the time to speak frankly about it. And I know about TI - we're supposed to have gotten the last sample they had in stock. I'm sharing the following content on Cemetech only because I think it could interest or entertain you. There are no other reasons - I don't bother about being famous, or about you visiting my website or not. Thank you for understanding. In an above post, Adriweb did invent an easy way to play music on TI-84 Plus, using the Orion voice module. Indeed, system 2.55/ORk plays a sound based on the vertical position whenever the cursor on the graph screen is moved. A first approach was therefore to use the function 'Trace' mode to obtain a sequence of sounds. In this mode, the cursor follows the plot of the function and shows you the coordinates of a point for each column of the screen. As Adriweb noted, in this context we were limited by the hardware: the width of the screen (96x64 pixels). We couldn't play without interruption a music of more than 96 notes in theory (95 in practice, the first note tending to ne skipped upon 'Trace' mode activation). Beyond 95 notes, you need a several seconds pause to switch the plot or chande the window before going on. I am pleased to announce today that I have literally exploded this hardware limitation! Instead of the function 'Trace' mode, let's use the statistics 'Trace' mode which works completely differently. Instead of giving the coordinates of points for each column of the screen, it gives them to each value of the X-axis list. With more than 95 elements, points are going to appear in the same screen column. But this time they can all be selected and therefore they are all playable! We are now limited by the software, as the maximum number of items for lists on TI-83+/84 is 999 - but it's enough to play musics more than 10 times longer than last time and to organize concerts! Here is for exemple a 125 notes music, proving that the 95 notes limit was crossed successfuly! The real question is not "what does it do" but "what can I make it do!" Quite cute. Unfortunately the tuning still suffers from the same issue, and it's mostly just disconcerting to listen to. There are certainly ways around it when arranging the music, but any kind of direct MIDI or other translation would likely be terrible. I can just see it. "The Great TI Community Orion Band." Yesterday I got the ORION, and took the unit off the calc it came with, and put it on my TI-84+ SE, the unit didn't work with the SE even after resetting it. I put the unit on the original calc, and reset the ORION to make it work. Now my ORION doesn't speak on the original calc even after resetting it. Can I get a bit of help? The Orion module needs the TI-84+ calculator to run a special OS. For us, the Orion TI-84+ calculator came with OS 2.55/ORk. Without that OS, the voice module just won't work. The 'Send OS' is disabled on the Orion TI-84+ calculator. So you'll need to dump the ROM and to rebuild a .8xu installable file for your TI-84+SE. As you disconnected the module from the Orion TI-84+ calculator, they're not synchronized anymore. Can you link me to a tutorial on how to do this? Could you check your OS version? What is it? 1st step is to get the ROM dump. You need to install the TiLP transfer software and double click on the system icon. I'll check if there is some tutorial. Will you make a version of MT3 for the ORION? © Copyright 2000-2019 Cemetech & Christopher Mitchell :: Page Execution Time: 0.300008 seconds.